The most frugal ingredients are whatever is currently in your fridge or pantry. These are the most frugal items you can use because they’re already paid for. Plan your meals and shopping lists around what you already have. Don’t sacrifice your health, though. If it isn’t good for you, donate it during the next canned food drive. When you’re shopping, pick up healthy items on sale. Fruit and vegetables often go on sale during the peak of their season so you’re also getting the best tasting too! Meat seems to go on sale randomly. If you know what to do with most cuts you can get whatever is on sale and then improvise. Here are some basic ingredients I like because they’re inexpensive, healthy and/or incredibly versatile. Consider using these in your next recipe creation. Beans – From chickpeas to pinto beans to lima beans, you can do a ton with these and they have lots of protein and fiber. Canned are super easy to use and cheap, and dried are even cheaper. Use white beans in a French-style ragout or cassoulet, grind chickpeas into hummus or turn black beans into a Cuban-style side dish. Grab a random can and then search google for the name of the bean and the word “recipe”. Beans are one of the original frugal foods so many recipes are designed around inexpensive items. Pork Shoulder – Not the healthiest cut of meat, but super cheap and really versatile once it’s roasted. See this post. Rice and other grains – These foods are inexpensive and provide lots of nutrients if you pick the right ones. Go for brown rice, barley, quinoa, millet and whole wheat couscous. These are good staple items to keep in your pantry. Vegatables – Nearly all vegetables are cheap and healthy, loaded with vitamins, minerals and fiber. Most people don’t get nearly enough. Avoid the starchy ones like potatoes and corn. Go for the leafy greens like spinach, collard greens and chard. Pasta is another great frugal ingredient. Buy it when it’s on sale. It keeps forever, and is ready in a hurry. Serve it with butter and olive oil, a red sauce or a white one. It teams well with beef, chicken, crab or shrimp, and more. 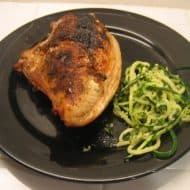 â€œFrugal and healthy recipe ingredients | Frugal Cookingâ€ ended up being a truly wonderful blog post, .